Hartlepool United have sold around 100 tickets for their Durham County Challenge Cup tie at Darlington. 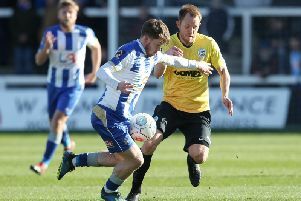 Hartlepool United have sold around 100 tickets for their Durham County Challenge Cup tie at Darlington later this month. The game, which will be played at Blackwell Meadows, will take place on Tuesday January, 22 (7.30pm kick-off). Pools received an allocation of 486 standing tickets for the game, which are priced at £10 for adults, £8 for seniors (62+) and £5 for children aged 16 and under. The visitors have also received 94 seating tickets for the game, which are priced at £12 for adults, £10 for seniors and £7 for children aged 16 and under. Children under the age of 11 will be able to attend for free. You can find more details by visiting the club's website. Meanwhile, Hartlepool's youth team recorded a dramatic victory over Notts County to close the gap at the top of the Youth Alliance League. After falling behind 10 minutes before half-time, Coleby Shepherd equalised for Pools in the 55th minute. Jack Leonard then scored a late winner for Hartlepool in the sixth minute of stoppage-time, sending them up to fourth in the North East table, just two points behind leaders Mansfield Town. It wasn't such good news for Hartlepool's women’s team, though, as the side suffered their third defeat of the season at Harrogate on Sunday afternoon. Craig Devon’s side went down 3-2 at the The CNG Stadium, despite goals from Alisha Smith and Jade Pye.